Handguns generally are more efficient, but just like parachutes and lifeboats, a trunk gun may increase the odds of surviving a very bad day. 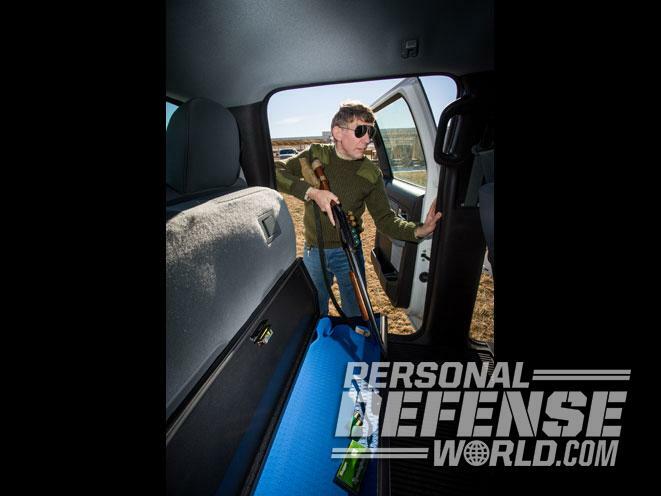 One good option for transporting a long gun such as a rifle or shotgun is a lockable storage compartment hidden under your vehicle’s back seat. Steel cabinets, like this model from Tuffy Security Products, discreetly hold firearms and other gear while keeping them accessible. 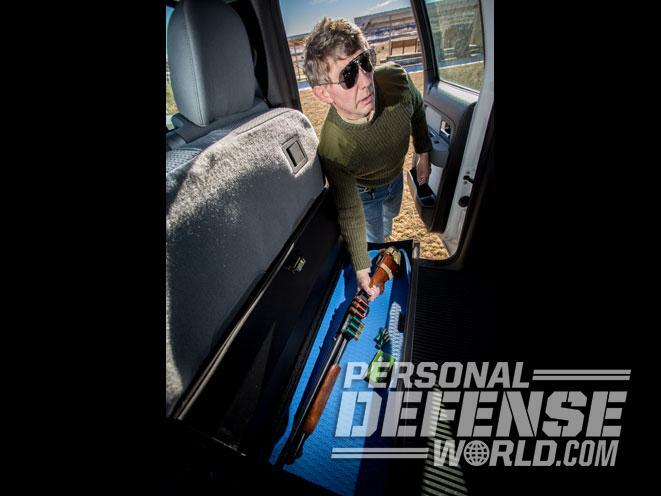 Trunk guns can be lifesavers, but you must carefully plan for how they will be deployed in a crisis. 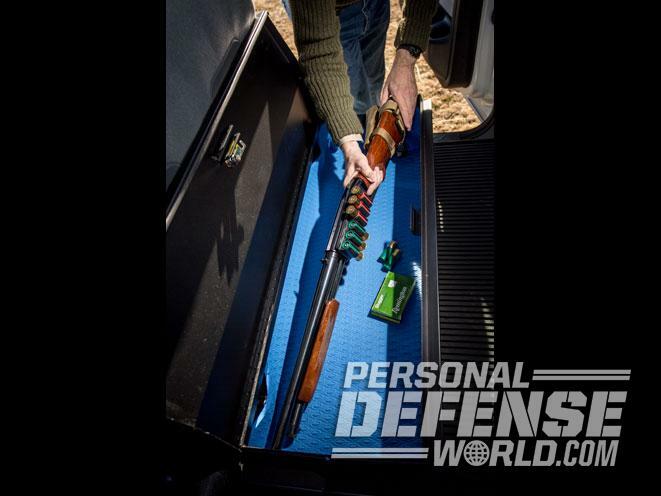 Unless properly secured, your weapons could possibly be damaged in your trunk. It’s also a good idea to keep them hidden from view. 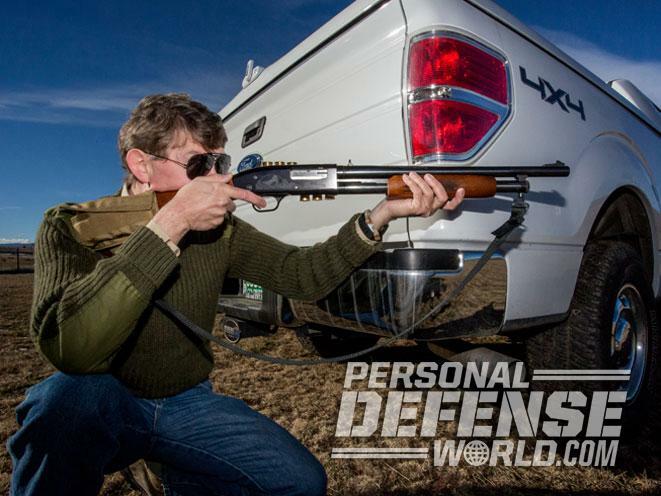 From the days of Wyatt Earp, lawmen have backed up a pistol with a rifle or shotgun. 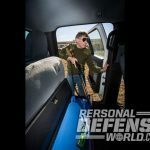 For decades, farmers and ranchers have carried a long arm in the rear window gun rack of their pickup trucks. 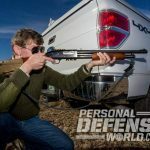 This practice seems to be disappearing, however, as transplanted city folks signal their disapproval at the sight of a lever-action rifle hanging in the back window of the truck parked next to theirs at a rural supermarket. In addition, responsible gun owners don’t want to risk theft of their firearm by leaving it in view, nor do they want the liability of their gun being stolen and used in a crime. 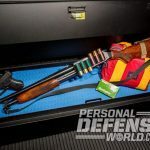 Despite these obvious and legitimate concerns, it’s worth exploring the benefits of a “trunk gun.” As the name implies, a trunk gun is usually a long gun (but it may be a handgun) that is kept locked in the trunk of a vehicle primarily for self-defense. 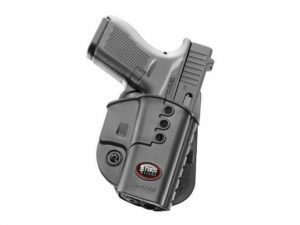 It is a means of carrying a firearm outside the home for people whose occupation or local laws prevent them from carrying a pistol on their person. 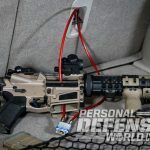 It is also a backup to a pistol for law enforcement officers and citizens—especially in remote areas where help is a long way away. Certainly there are some valid reasons to carry a trunk gun, such as greater firepower and longer effective range. Trunk guns can be useful. Roadside breakdowns may invite passing criminals to see if they can take advantage of the situation. In rural areas, putting down an injured animal that has been hit by a vehicle has often been accomplished humanely with a rifle or shotgun. Acts of violence are not always one-on-one or even three-on-one confrontations. Police officers carry long arms in their cars for events like these because rifles and shotguns perform a slightly different function than a pistol. A rifle is like a fire hose. It takes a while to get it uncoiled and running, but the effectiveness is worth the wait. A pistol, on the other hand, is like a fire extinguisher—a fast response to the problem, but alone it may not be enough to put the fire out. Fire crews carry both. Police officers carry pistols and long arms. Should the well-prepared citizen be any different? Long arms generally provide some or all of the following features: greater accuracy, longer range and increased effectiveness. There’s a reason why social shotguns are also called “riot guns.” They are often more intimidating than a pistol when pointed at a criminal. 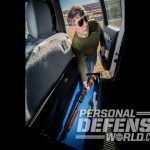 This raises an important question about how the trunk gun might actually be used: How long does it take to access a trunk gun from the car’s trunk, backseat or the locked security cabinet in the bed of a pickup truck? It’s a lot longer than drawing a pistol from a holster. 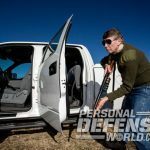 Along the southern border of the U.S., there are high-risk rural areas where the locals routinely carry more than just a pistol for protection. In other rural parts of America, travelers may find themselves in close proximity to illegal pot-growing operations. 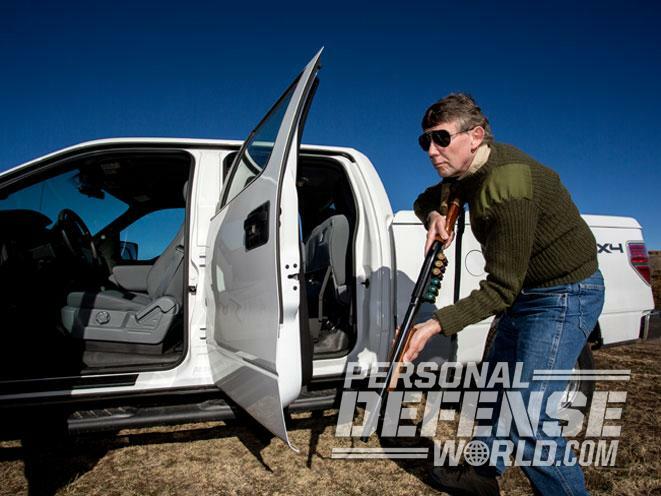 A rifle or shotgun may provide a greater level of security in these situations, although that doesn’t mean we can put common sense aside just because we’re packing more firepower and charge into dangerous places just for the fun of it. General Custer did that at the Little Big Horn with disastrous results. 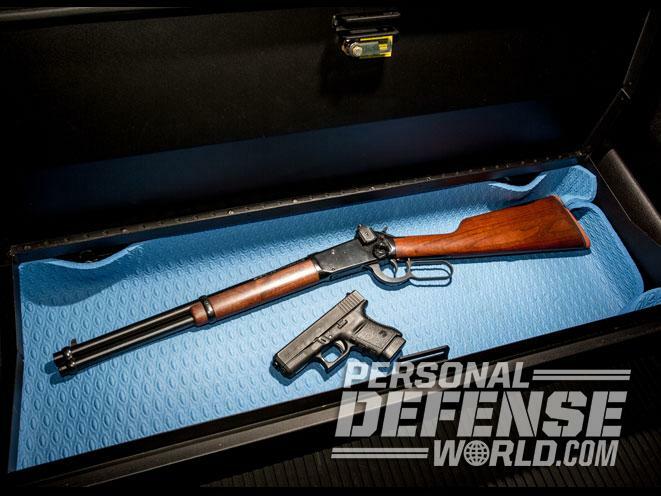 There are some problems associated with carrying a trunk gun. First, it may not be legal in some jurisdictions, so check your local laws first. In Colorado, for example, a rifle or shotgun cannot be carried in a vehicle with a round in the chamber. In Illinois, ammunition must be transported separate from the weapon. Theft is another concern. No responsible gun owner wants to lose a valuable firearm or risk the liability and guilt of their gun being used in a crime to wound or kill an innocent person. There needs to be a way to secure the firearm out of sight. 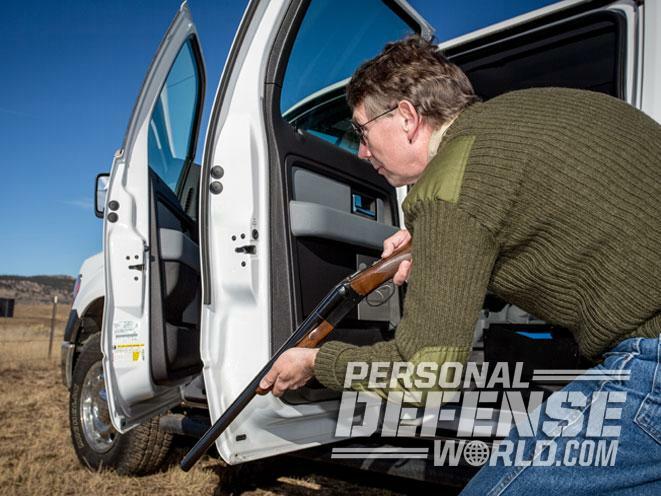 The first step is to examine the vehicle and determine where a gun might actually fit. With a regular sedan, the trunk or under the back seat are the main choices for storage. 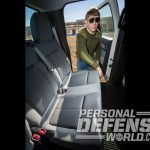 An SUV may have a larger cargo area, but there are more windows, which means that concealment may be a bigger problem. An RV is big enough that it may be possible to install a small steel security cabinet inside one of the closets. 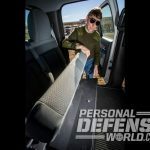 Another option is to install a locking steel security box, such as those made by Tuffy Security Products, that are designed for specific vehicles and fit in the trunk, truck bed or under the rear seat. Keeping the gun secure begins with not advertising the fact that a gun is in the vehicle. The most basic level of security is probably to loop a plastic-coated steel bicycle cable through the open action and padlock the looped ends to a solid object inside the vehicle, such as a steel seat bracket. 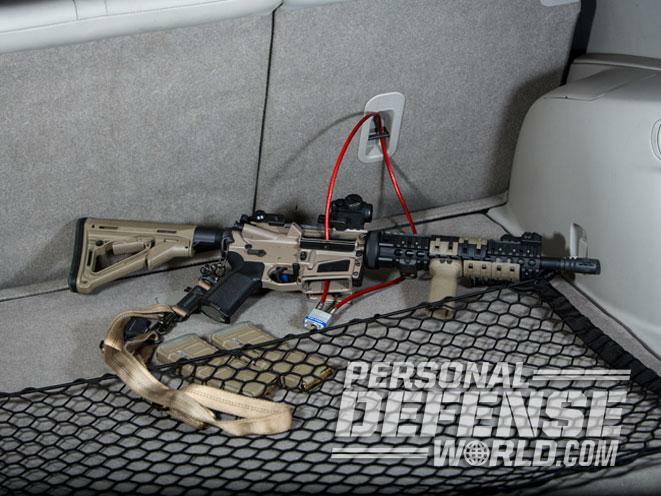 Slide the gun under the rear bench seat and throw a towel or blanket over the gun to hide it from view. 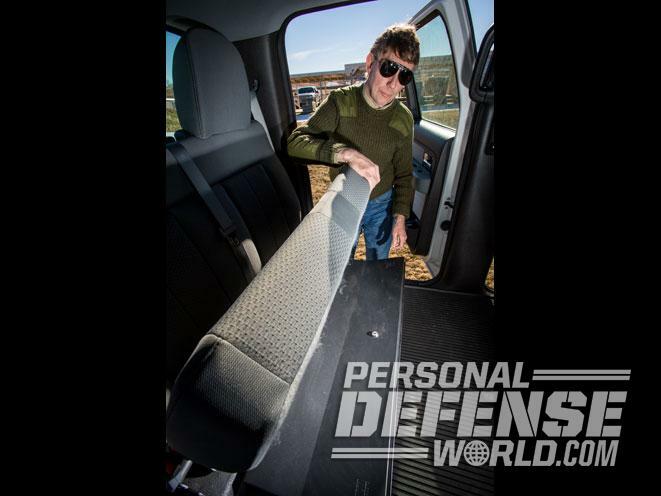 This may hide it from anyone peering into the car, but there may be occasions, such as giving a ride to a neighbor or coworker, when this method may not be enough to hide it from passengers. In addition, if the vehicle is stolen, the gun goes with it. Along with deciding where to store a rifle or shotgun in a vehicle is the decision on which firearm will be used. 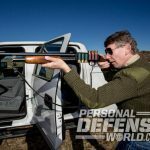 “Speaking very generally, a rifle that is longer than 1 meter [39 inches] tends to be cumbersome.” Jeff Cooper wrote in his book The Art of the Rifle . 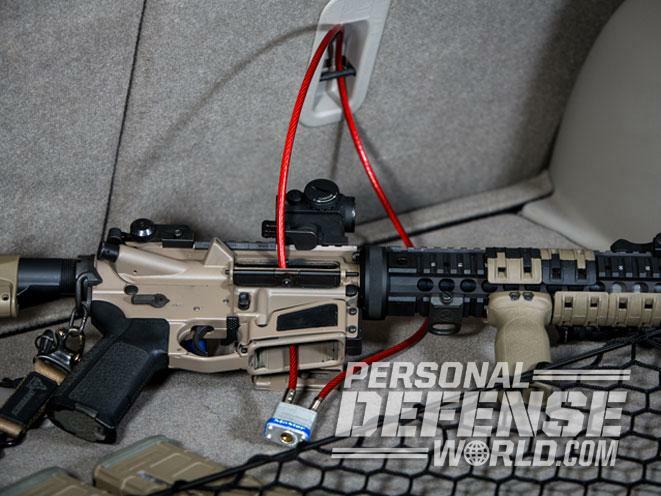 Storing and manipulating a firearm in a vehicle usually requires the gun to be compact. Some examples are AR-15s, AK-47s, Ruger Mini-14s, Kel-Tec SU-16s, M1 Carbines and pistol-caliber carbines such as the Kel-Tec SUB-2000 and Beretta Cx4 Storm, Winchester and Marlin lever-action rifles and the good old standby of a 20- or 12-gauge shotgun such as a Remington 870 or a Mossberg 500. Some of the aforementioned long arms are available with collapsible or folding stocks and shorter barrels. 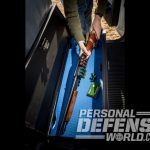 Kitchen table gunsmiths should note that federal law mandates rifle barrels to be at least 16 inches and shotgun barrels to be at least 18 inches long. Long arms like these are all viable candidates that can deliver an effective shot at distances of at least 50 yards. 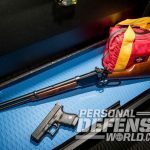 Lawyers will raise questions about the legality of a self-defense shooting at ranges longer than the usual conversational distances, but this article is more about the technical ability of long arms rather than the legal constraints. If in doubt, always consult a legal expert before making a decision. 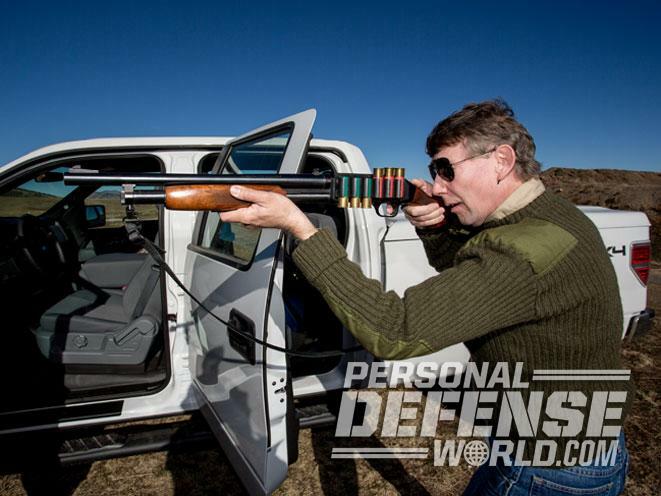 Another option where storage space is limited is a takedown shotgun, such as the double-barrel Stoeger Coach Gun. 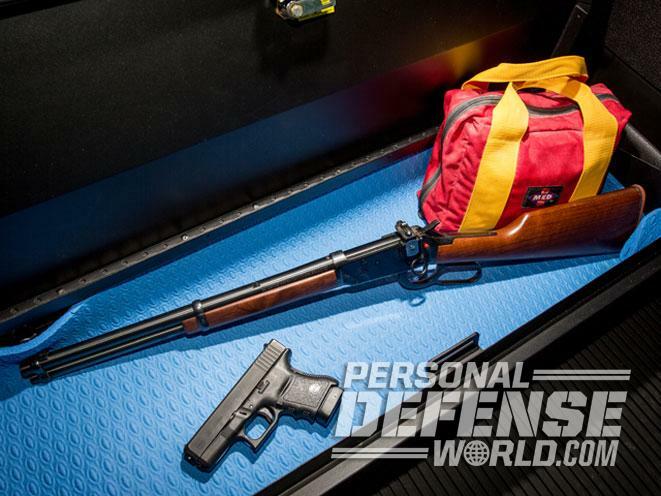 These can be dismantled into three pieces—barrel, forend and stocked action—for easy storage. The downside is that it takes a few moments to reassemble the gun, which may be a problem if it is needed in a hurry. 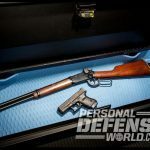 Since any trunk gun, by definition, will be stowed in a vehicle, it should be durable and able to withstand being bumped around and able to operate in a wide range of temperatures and humidity. 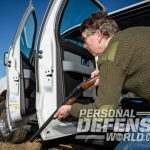 Aside from an actual self-defense shooting, there will be times when the firearm has to be carried away from the vehicle. 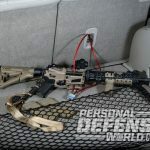 The gun owner may be staying in a hotel and not want to risk theft by leaving the gun in their vehicle overnight, or it may be carried into the home or into a gunsmith’s premises. There is no good reason to spook any bystanders, so the gun needs to be made safe and carried unloaded in a gun case or some sort of bag, such as a golf bag or duffel bag, that hides the outline. For both physical and visual security, it could even be chained up to a solid object in the vehicle and then stored inside the case. To be clear: Never carry a firearm in a case or in a vehicle with a round in the chamber. Never trust a manual safety alone. Guns can shift in transit, and if the trigger gets bumped against something, it could be disastrous. In the same way that a pistol needs a holster, a long arm needs a sling. The sling allows the person using the gun to free their hands for some other task while still maintaining control of the weapon. In a Hurricane Katrina scenario, I don’t want to risk letting go of my firearm while I’m standing in thigh-deep water unless it is secured to me with a good sling. Dropping a firearm is never a good idea. I don’t want somebody to pick it up and either shoot or club me with it. When the trouble is over, it’s better to get the gun behind me on the sling just as I would holster a pistol. I want to get my hands empty and in plain view before the police arrive so that I can explain my side of the story without anyone worrying about twitchy trigger fingers. Police officers I’ve discussed this with have said that if they are called to a shooting where a person is holding a firearm, the cops will first gain control of the situation by pointing a gun at the person. The police will undoubtedly disarm everybody at the scene until they can sort out the bad guys from the good guys. Everybody involved can expect to be handcuffed while the cops investigate. Even the good guys might be detained for questioning. In this highly volatile situation, I want to have the long arm slung behind me and be able to have both hands empty and in the air. This is not a good time to have one’s actions misinterpreted. 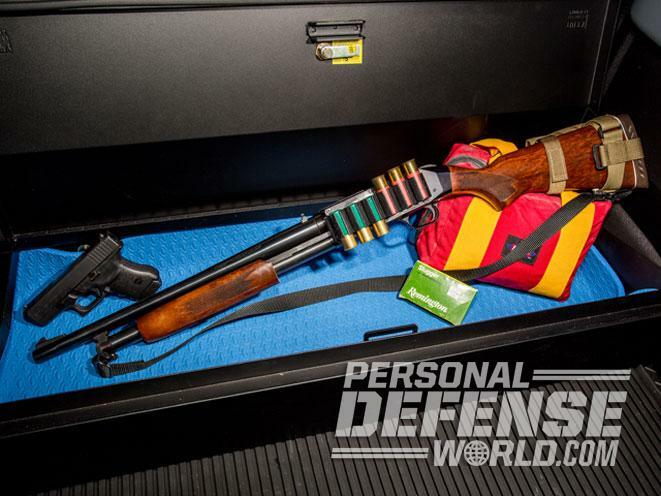 Carrying a trunk gun requires careful planning. 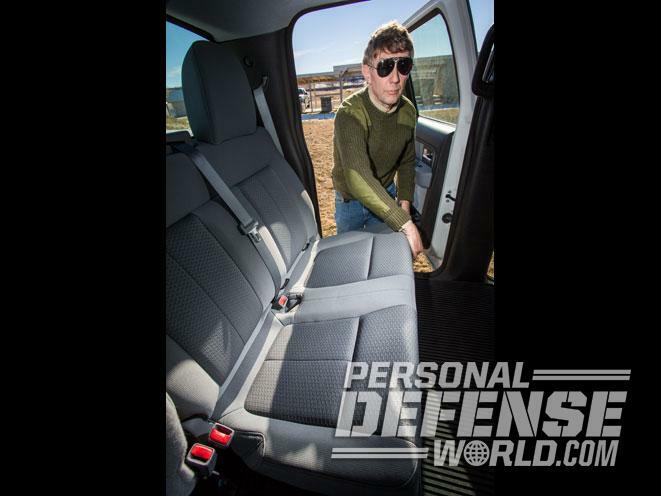 They are cumbersome and difficult to conceal inside most vehicles and are slow to deploy. Handguns generally are more efficient, but just like parachutes and lifeboats, a trunk gun may increase the odds of surviving a very bad day.